Lichthaus Arnsberg presents the exhibition "Chrome" by Italian artist Riccardo Previdi. Chrome is a shiny silver-white metal. Characteristics of the lighthouse already become apparent in the title. But in preparing the exhibition Previdi was not so much concerned with the existing architecture but with a theme of our everyday life: the Internet. 2008 Google Inc. introduced its new web browser “Chrome”, which quickly became popular. One of the main functions of this new, freely available programme is the development of “Cloud Computing”, such as offering virtual software and data storage over a network. The new version of the programme is still being advertised widely nowadays. Not only the title “Chrome” but also Google’s prime colours blue, red, yellow and green are very present in the mind of the artist and materialise in the shape of a light installation. Popular culture, design and the media are important inspirations for Previdi, which he questions aesthetically and develops further. It is, however, difficult to recognise whether the artist is more occupied with the critical or the formal examinations of everyday life, as he shows passion both towards analysis and giving visual shape to an idea. 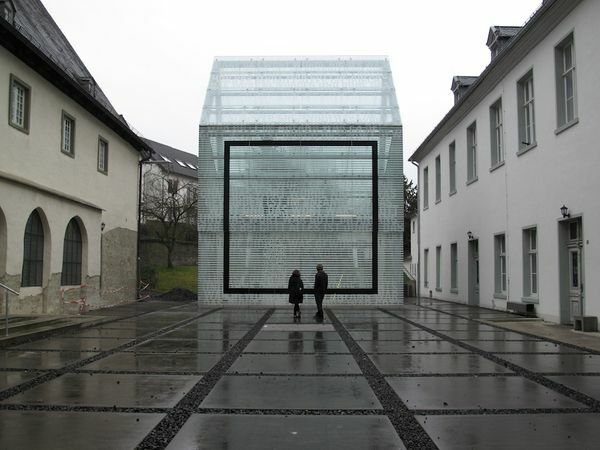 His exhibition at Lichthaus Arnsberg consists of three elements: a black square mounted on the glass façade; an installation of a glitter net, image and neon; and “Bacterio” – a hanging foil with a printed pattern. All works refer to the openness, transparency and structure of the building – as of the Internet – and play indirectly with the architecture and history of the place. 100 years after Malevitsch it is still not easy to paint a square. Previdi dares to attach a square to the northern glass façade of the Lichthaus, which, despite its monumental size of 7 x 7 metres, conveys a feeling of weightlessness. Suddenly a digital pixelled image is formed: the square transforms the Lichthaus into a monitor, the visitors become protagonists and the written-on façade turns into credits for his new film. The work “Bacterio” is a pattern designed at the end of the 1970s by Ettore Sottsass for the new office furniture by Olivetti (Italian computer company). The Bacterio motif in the exhibition has been changed, printed onto advertising banners and rolled down from the ceiling. Surely this decorational pattern is viewed differently in today’s world of the Internet – here bacteria and viruses are avoided. Previdi speculates with this source of irritation and thus offers an additional structure to visualise the specific composition. With “Chrome”, Previdi addresses relevant problems within our media culture, he transforms the Lichthaus into a monitor and expands the historical context of the monastery archives. Riccardo Previdi was born in 1974 in Milan and lives in Berlin. His works will be on view in the exhibition “We are all astronauts” at Marta Herford (June 2011), in “Beyond Gestaltung” at Kunstverein Bielefeld (September 2011) and at the Instituto Italiano di Cultura, New York (December 2011). Furthermore, he had exhibitions at Sommer & Kohl in Berlin (2010), De Vleeshal Middelburg (2009), Galerie Francesca Minini, Milano (2009), Manifesta VII (2008), MART Rovereto (2008), Mambo Bologna (2009), MARTA Herford (2008) and ArtBasel Statements (2007).